Please join HAL5 and Straight to Ale for a special presentation at a special location to celebrate the 40th anniversary of the release of the original Star Wars. 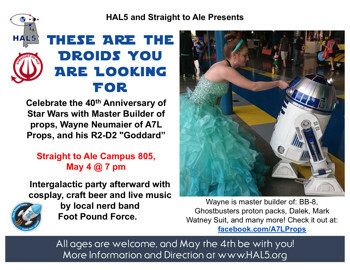 Wayne Neumaier of A7L Props will be presenting These ARE the Droids You Are Looking For in the former school gymnasium turned into a brewery in Straight to Ale at Campus 805. Mr. Neumaier [see 2StoryProps.BlogSpot.com] will bring his own creations, R2-D2 "Goddard" for a special interactive presentation on the construction and operation of his droid. Enjoy an adult beverage (or not) while a master builder of props and costumes shows off some of his creations. Stick around after the talk for an intergalactic party to close out the night with cosplay, craft beer and live music by local nerd band Foot Pound Force. All ages are welcome, and May the 4th be with you!